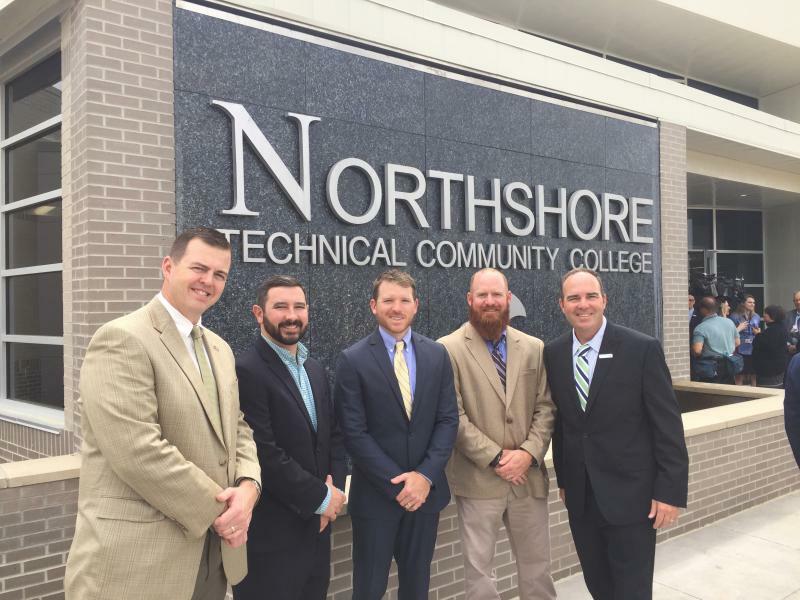 Lincoln Builders of Baton Rouge joined Louisiana Community Technical College System (LCTCS) for the ceremonial ribbon cutting at the recently completed new Science, Technology, Engineering & Math (STEM) campus at Northshore Technical Community College in Lacombe, Louisiana. Lincoln teamed with Chenevert Architects LLC to design and construct the 32,000-square-foot facility, which includes academic offices and classrooms, science labs, a center for innovation, an outdoor lab, general studies classrooms, and support spaces such as administration, financial aid, faculty offices, conference rooms and general use. Pictured are Chancellor William Wainwright (right) with Lincoln's Baton Rouge project team VP-Operations Keith Keller, Project Manager Russ Russo, Project Superintendent Courtland Foley and Field Operations Manager Justin Whittington.